How do you categorize a post that belongs to the world of today, yesterday, scent, memory and the obliteration of geographical borders and time zones? What title do you give a subject that is big enough to fill your imagination but small enough to fill a tiny bottle? I don’t know. 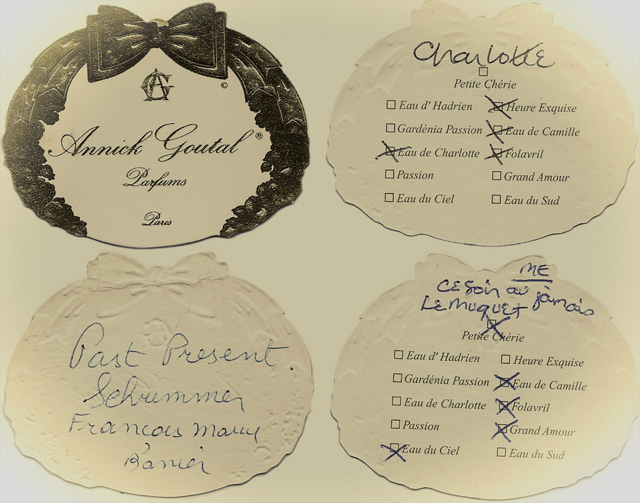 I’m speaking of perfume—specifically, the perfumes of Annick Goutal—which have accompanied me in my journeys back and forth across the ocean and the North American continent. I first met her (in the form of her scents), bizarrely enough, in Portland, Oregon at the Perfume House in the Hawthorne neighborhood of the Southeast district of the city. In those days, toward the middle of the 90’s, I lived on 32nd Place, and often as I beat my familiar path to various cafés and grocery stores, I would pass the forlorn, oddly renovated structure at 33rd Avenue and Hawthorne. Portland was full of weirdness then (hopefully it still is), and I wrote the place off for months as a lair of the New Age too extreme for my tastes. But one day, I went in. Recent divorces are the best motivation to try new things, and this was one. I was in for a heady surprise. The woman inside told me that the store was located here because the house had been built in 1906, a significant year in the history of Parisian perfumes. I don’t remember why exactly, but a quick check with Google tells me that a lot did happen that year: The first Van Cleef & Arpel boutique opened in Paris; Jacques Guerlain created Après L’Ondée; and Coty introduced La Rose Jacqueminot to name a few. On the spot, I had my first lesson in the difference between natural and synthetic perfumes (Chanel No. 5 was the first, most famous perfume to use high doses of synthetic material). And I learned that this dark, ungainly house was one of the largest purveyors of the world’s best perfumes in the United States. (The Powell’s Books of olfactory pleasure.) Utterly taken by this new world of thought and frivolity—dragged helplessly by my very senses—I bought bottles of Chanel No. 5, Chanel No. 19, Annick Goutal Eau de Camille and Annick Goutal Eau d’Hadrien—each of which seduced me in its turn. Good thing I was single and earning well. I wore all these perfumes alternately, but the Goutal scents spoke directly to my heart. Early on the light, asexual Eau d’Hadrien was my favorite, but as I grew up (not old) in the post-divorce years, I found myself tending toward more challenging concoctions. I had transferred to Amsterdam, fallen in love again, and moved to Milan when destiny, timely as ever, threw me another chance to up the ante on my perfume passion. A dear friend, Suzi, from the U.S. was coming to Paris. Would I meet her there? Bien sûr. That’s what trains are for. It was one of those visits—inevitably too brief—when you realize that time is flying, friendships are precious, and you have 48 hours to create memories that will hold you together for the next decades. Accordingly, we found ourselves in the Annick Goutal boutique in Saint-Germain-des-Prés. We must have been there an hour or more, talking with the loquacious clerk, a modern day Wilma Flintstone (it was all in the necklace) well versed in aromatherapy, philosophy, photography and the finer points of being a “real” woman. (Andie McDowell did not fare particularly well in her assessment, as I recall.) We left buzzing with new ideas about art and ourselves via the vehicle of perfume. In short order, the clerk pegged me as a Folavril-Heure Exquise-Eau de Camille-Eau de Charlotte woman. Suzi, she said, was more the Ce Soir ou Jamais-Grand Amour type. (How gloriously over the top is that name: “Tonight or Never”?) We had been seen, recognized, understood and placed on pedestals. It felt amazing. 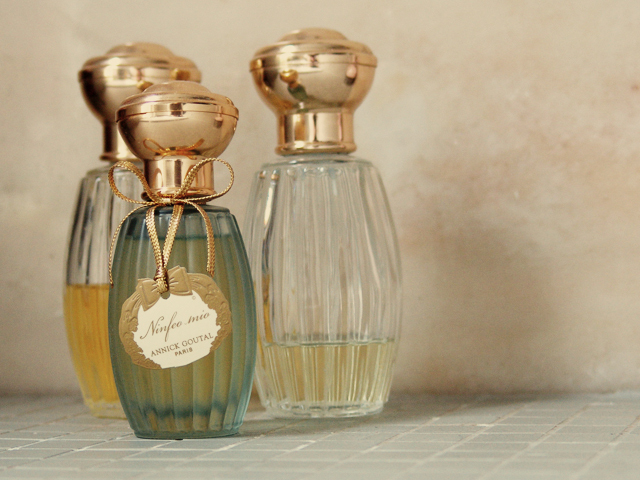 A few days ago, Suzi pulled out the notes she’d taken that day on the backs of perfume labels. We discovered the photography book Past-Present by François-Marie Banier. I will be ordering it soon. What could better sum up the power of these delicate liquids than those two words. The past and the present are inside them—memory, emotion, passage—a purely Proustian thing. Final notes: 1. My mother is well and thriving and frequently edits my posts. 2. I named my first child Camille. 3. Today is a Folavril day. 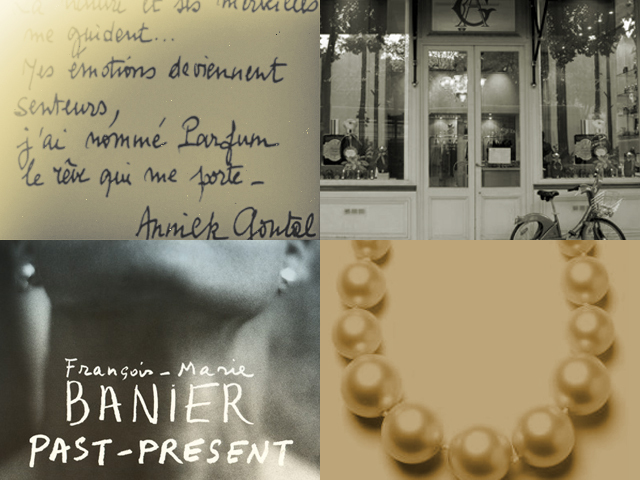 This entry was posted in FRANCE, ITALY, WHAT WE WEAR and tagged Annick Goutal, Ce Soir ou Jamais, eau d'Hadrien, eau de Camille, eau de Charlotte, Paris, perfume, Perfume House, Portland Oregon. Bookmark the permalink. Lovely and evocative, Charlotte. I see why you’re so successful in your profession – I couldn’t resist, so just ordered some Annick Goutal from the Website. Did you know it’s owned by the daughter of the Taittinger Champagne family? Good taste is in the genes – or the nose? Mary, which one did you get?